Ucrete® is the original cementitious urethane technology designed for seamless, monolithic floor overlays and resurfacing, and has been the solution to challenging industrial flooring problems around the world for more than 30 years. Engineered as a superior alternative to acid brick, quarry tile and coatings, Ucrete® offers unequaled resistance to physical abuse, thermal shock, bacteria growth and a wide range of aggressive chemicals. Long-term toughness and durability in extreme industrial environments have earned Ucrete® its reputation as “The Floor That Lasts.” There are no equals. Ucrete® Heavy duty Polyurethane Systems are unique as they are specifically formulated to meet the demands of existing and new build fast track projects. A range of resin rich floor systems that are moisture tolerant are ideally suited to the most aggressive industrial environments, solvent free, non tainting and fully serviceable at temperatures up to 248°F @ .354 inch thickness. Ucrete® industrial flooring is available in a range of standard systems in coloured finishes which include smooth, textured, terrazzo surfaces and antistatic grades. UCRETE Systems can be exposed to severe daily cleaning techniques, including live steam, hot water, aggressive detergents and disinfectants. UCRETE is unaffected by freeze/thaw cycles and withstands extreme temperature ranges while in service and during cleaning. Unlike other flooring systems, UCRETE won’t delaminate due to thermally induced stresses. UCRETE’s surface profile can be adjusted to provide varying degrees of skid inhibition. UCRETE Systems have been resisting damage from caustics, organic and inorganic acids, solvents and most other commonly used chemicals for over 30 years. Unlike mortar joined quarry tile and acid brick, UCRETE Seamless Systems absorb direct impact blows by distributing the loads throughout the system. UCRETE Systems pass ASTM G 21 and independent laboratory tests confirm that UCRETE will not support the growth of E.coli or salmonella bacteria. UCRETE has no grout joints to crack or harbor dirt or bacteria, resulting in a cleaner, safer production environment. UCRETE’s low odor makes it possible to keep adjacent work spaces open during installation and cure. The combination of faster turnaround times and minimized downtime with a proven track record of long-term performance creates superior per square foot value versus many other flooring systems. Ucrete HF is a three-component polyurethane-concrete flooring system. This troweled, monolithic flooring system is installed from 1/4″ â€“ 3/8″ (6 â€“ 9.5 mm) or greater. The thickness is determined by the service and cleaning temperatures and the severity of traffic expected. Heavy Duty Trowel Grade Floors are extremely tough and have many physical properties that exceed those of typical concrete. Actual color and texture of the Ucrete products may vary slightly from the samples shown here. Make final approvals from physical samples. The final color of the Ucrete installed interior or exterior, may darken or shift under exposure to UV light, but the performance of the product will not be affected. Ucrete® HP and HP/Q are three-component polyurethane-concrete systems with a broadcast aggregate. Both of these systems are installed at a finished thickness of 1/4 – 3/8″ (6 – 9 mm). The thickness is determined by the service and cleaning temperatures and the severity of traffic expected. Ucrete® HP/Q uses a colored quartz aggregate to yield a textured surface. Ucrete® HP uses a translucent quartz aggregate. Ucrete® floors are extremely tough and have many physical properties that exceed those of typical concrete. Ucrete® WR is a three-component polyurethane-concrete material. It is used with other Ucrete® products to form cove bases. Ucrete® WR applies by trowel and yields excellent results; it can be installed to a depth of 1/8″ (3 mm) in a single lift or to greater thicknesses in multiple lifts. It is extremely tough and has many physical properties that exceed those of typical concrete. Thermal shock conditions can wreak havoc on the adhesion of coatings and toppings to concrete. 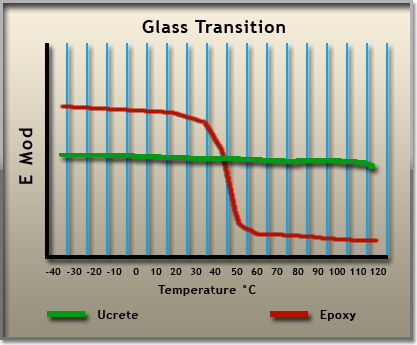 Coefficient of Thermal Expansion and Glass Transition (Tg) both provide meaningful data with which to evaluate the ability of a material to remain bonded to concrete in these tough conditions. 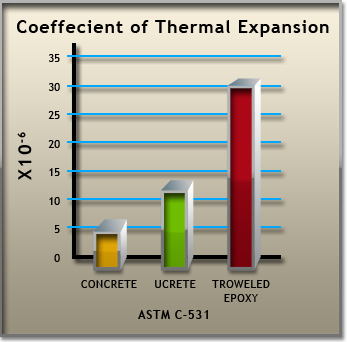 This Chart clearly exhibits that the coefficient of thermal expansion of Ucrete is very close to concrete in comparison to another commonly used flooring material. Under thermal cycling conditions, Ucrete expands and contracts very similar to concrete which virtually eliminates differential flexing that occurs with other materials and allow Ucrete to maintain unmatched tenacious adhesion to concrete. The chart demonstrates the Tg phase for the same materials. Some materials will undergo physical change when exposed to thermal cycling conditions and this repetitive change weakens adhesion at the bond line increasing the likelihood of delamination. Materials that change in modulus during thermal cycling – becoming more fluid under heat and brittle in cold temperatures – create a stress that repetitively works against the adhesive bond to concrete. Ucrete remains solid-like and consistent throughout thermal cycling and, as a result, is not subject to these related physical stresses that frequently lead to delamination and adhesive failure of a flooring system. 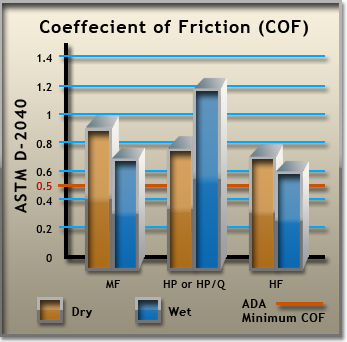 Ucrete exceeds ADA requirements for slip resistance .5 as to ASTM 2047. We are among a network of trained and approved contractors experienced in the installation of Ucrete Systems and are on your side, committed to quality and owner satisfaction. This international group of contractors, in conjunction with professional architects and engineers, ensure that Ucrete Systems are installed right the first time.